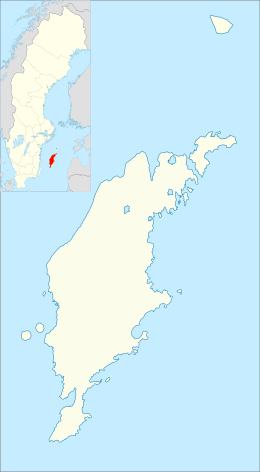 Gotland (/ˈɡɒtlənd/, Swedish: [ˈɡɔtːland] ( listen); older spellings include Gottland /ˈɡɒtlənd/ or Gothland /ˈɡɒθlənd/; Gutland in the local dialect) is a province, county, municipality, and diocese of Sweden. It is Sweden's largest island. The province includes the islands of Fårö and Gotska Sandön to the north, as well as the Karlsö Islands (Lilla and Stora) to the west. The population is 58,595, of which about 23,600 live in Visby, the main town. The island of Gotland and the other areas of the province of Gotland make up less than one percent of Sweden's total land area. The island's main sources of income are agriculture along with food processing, tourism, information technology services, design, and some heavy industry such as concrete production from locally mined limestone. From a military viewpoint, it occupies a strategic location in the Baltic sea. As of 2018 the Gotland Regiment has been re-raised and is the first time since World War II that a new regiment has been established in Sweden. Sockens on Gotland. The sockens are written in small text, the bolder names are the names of the municipalities existing 1950–1970. The island is the home of the Gutes, and sites such as the Ajvide Settlement show that it has been occupied since prehistory. A DNA study conducted on the 5,000-year-old skeletal remains of three Middle Neolithic seal hunters from Gotland showed that they were related to modern-day Finns, while a farmer from Gökhem parish in Västergötland on the mainland was found to be more closely related to modern-day Mediterraneans. This is consistent with the spread of agricultural peoples from the Middle East at about that time. Gutasaga contains legends of how the island was settled by Þieluar and populated by his descendants. It also tells that a third of the population had to emigrate and settle in southern Europe, a tradition associated with the migration of the Goths, whose name has the same origin as Gutes, the native name of the people of the island. It later tells that the Gutes voluntarily submitted to the king of Sweden and asserts that the submission was based on mutual agreement, and notes the duties and obligations of the Swedish King and Bishop in relationship to Gotland. According to some historians, it is therefore an effort not only to write down the history of Gotland, but also to assert Gotland's independence from Sweden. The number of Arab dirhams discovered on the island of Gotland alone is astoundingly high. In the various hoards located around the island, there are more of these silver coins than at any other site in Western Eurasia. The total sum is almost as great as the number that has been unearthed in the entire Muslim world. These coins moved north through trade between Rus merchants and the Abbasid Caliphate, along the Silver-Fur Road, and the money made by Scandinavian merchants would help northern Europe, especially Viking Scandinavia and the Carolingian Empire, as major commercial centers for the next several centuries. The Berezan' Runestone, discovered in 1905 in Ukraine, was made by a Varangian (Viking) trader named Grani in memory of his business partner Karl. It is assumed that they were from Gotland. The Mästermyr chest, an important artefact from the Viking Age, was found in Gotland. On 16 July 1999, the world's largest Viking silver treasure, the Spillings Hoard, was found in a field at Spillings farm northwest of Slite. The silver treasure was divided into two parts weighing a total of 67 kg (148 lb) (27 kg (60 lb) and 40 kg (88 lb)) and consisted mostly of coins, about 14,000, from foreign countries, mostly Islamic. It also contained about 20 kg (44 lb) of bronze objects along with numerous everyday objects such as nails, glass beads, parts of tools, pottery, iron bands and clasps. The treasure was found by using a metal detector, and the finders fee, given to the farmer who owned the land, was over 2 million crowns (about US$308,000). 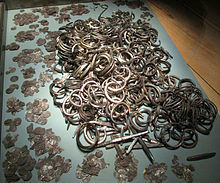 The treasure was found almost by accident while filming a news report for TV4 about illegal treasure hunting on Gotland. Early on, Gotland became a commercial center, with the town of Visby the most important Hanseatic city in the Baltic Sea. In late medieval times, the island had twenty district courts (tings), each represented by its elected judge at the island-ting, called landsting. New laws were decided at the landsting, which also took other decisions regarding the island as a whole. The city of Visby and rest of the island were governed separately, and a civil war caused by conflicts between the German merchants in Visby and the peasants they traded with in the countryside had to be put down by King Magnus III of Sweden in 1288. In 1361, Valdemar Atterdag of Denmark invaded the island. About 1,500 Gotlandic farmers were killed by the Danish invaders after massing for battle at Mästerby. The Victual Brothers occupied the island in 1394 to set up a stronghold as a headquarters of their own in Visby. At last, Gotland became a fief of the Teutonic Knights, awarded to them on the condition that they expel the piratical Victual Brothers from their fortified sanctuary. An invading army of Teutonic Knights conquered the island in 1398, destroying Visby and driving the Victual Brothers from Gotland. In 1409, Grand Master Ulrich von Jungingen of the Teutonic Knights guaranteed peace with the Kalmar Union of Scandinavia by selling the island of Gotland to Queen Margaret of Denmark, Norway and Sweden. The authority of the landsting was successively eroded after the island was occupied by the Teutonic Order, then sold to Eric of Pomerania and after 1449 ruled by Danish governors. In late medieval times, the ting consisted of twelve representatives for the farmers, free-holders or tenants. Since the Treaty of Brömsebro in 1645, the island has remained under Swedish rule. On 19 September 1806, the Swedish government offered sovereignty of Gotland to the Order of St. John of Jerusalem, who had been expelled from Malta in 1798, but the Order rejected the offer since it would have meant renouncing their claim to Malta. The Order never regained its territory, and eventually it reestablished itself in Rome as the Sovereign Military Order of Malta. On 22 April 1808, during the Finnish War between Sweden and Russia, a Russian army landed on the southeastern shores of Gotland near Grötlingbo. Under command of Nikolai Andreevich Bodisko 1,800 Russians took the city of Visby without any combat or engagement, and occupied the island. A Swedish naval force rescue expedition was sent from Karlskrona under the command of admiral Rudolf Cederström with 2,000 men; the island was liberated and the Russians capitulated. Russian forces left the island on 18 May 1808. The traditional provinces of Sweden serve no administrative or political purposes today, but are historical and cultural entities. In the case of Gotland, however, due to its insular position, the administrative county (län), Gotland County, and the municipality (kommun), Gotland Municipality, both cover the same territory as the province. Furthermore, the diocese of Visby is also congruent with the province. Gotland is traditionally divided into 92 sockens. On 1 January 2016, they were all reconstituted into Districts, administrative areas with the same borders as the former sockens. Gotland was granted its arms in about 1560. The coat of arms is represented with a ducal coronet. Blazon: "Azure a ram statant Argent armed Or holding on a cross-staff of the same a banner Gules bordered and with five tails of the third." The county was granted the same coat of arms in 1936. The municipality, created in 1971, uses the same picture, but with other tinctures. The Gotlandic flag displays the Gotlandic coat of arms, white on red ground, known from the 13th century in the shape of the seal of the Gutnish Republic with the proud ram. It reads: "Gutenses signo xpistus signatur in agno". Gotland is Sweden's largest island, and it is the largest island fully encompassed by the Baltic Sea (with Denmark's Zealand at the Baltic's edge). With its total area of 3,183.7 km2 (1,229.2 sq mi) the island of Gotland and the other areas of the province of Gotland make up 0.8% of Sweden's total land area. The province includes the small islands of Fårö and Gotska Sandön to the north, as well as the Karlsö Islands, (Lilla and Stora) to the west, which are even smaller. The island of Gotland has an area of 2,994 km2 (1,156 sq mi), whereas the province has 3,183.7 km2 (1,229.2 sq mi) [3,151 km2 (1,217 sq mi) of land excluding the lakes and rivers]. The population is 57,221, of which about 23,600 live in Visby, the seat of the municipality as well as the capital of the county. About two-fifths of the island's population live in Visby. There are several shallow lakes located near the shores of the island. The biggest is Lake Bästeträsk, located near Fleringe in the northern part of Gotland. The Hoburg Shoal bird reserve is situated on the southern tip of the island. The highest point of the island is Lojsta Hed which stands 82 m (269 ft) above sea level. Gotland has a semi-continental variety of a marine climate. This results in larger seasonal differences than typical of marine climates in spite of it being surrounded by the Baltic Sea for large distances in all directions. This is due to strong continental winds travelling over the sea from surrounding great landmasses. Gotland is made up of a sequence of sedimentary rocks of a Silurian age, dipping to the south-east. The main Silurian succession of limestones and shales comprises thirteen units spanning 200 to 500 m (660 to 1,640 ft) of stratigraphic thickness, being thickest in the south, and overlies a 75 to 125 m (246 to 410 ft) thick Ordovician sequence. It was deposited in a shallow, hot and salty sea, on the edge of an equatorial continent. The water depth never exceeded 175 to 200 m (574 to 656 ft), and shallowed over time as bioherm detritus, and terrestrial sediments, filled the basin. Reef growth started in the Llandovery, when the sea was 50 to 100 m (160 to 330 ft), and reefs continued to dominate the sedimentary record. Some sandstones are present in the youngest rocks towards the south of the island, which represent sand bars deposited very close to the shore line. The lime rocks have been weathered into characteristic karstic rock formations known as rauks. Fossils, mainly of crinoids, rugose corals and brachiopods, are abundant throughout the island; palæo-sea-stacks are preserved in places. The island's main sources of income are agriculture along with food processing, tourism, IT solutions, design and some heavy industry such as concrete production from locally mined limestone. Most of Gotland's economy is based on small scale production. In 2012, there were over 7,500 registered companies on Gotland. 1,500 of these had more than one employee. Gotland has the world's northernmost established vineyard and winery, located in Hablingbo. Gotland occupies a strategic location in the Baltic sea from a defence viewpoint. The Swedish government decided in March 2015 to begin reestablishing a permanent military presence on Gotland, starting with an initial 150 troop garrison, consisting primarily of elements from the Swedish Army. It has been reported that the bulk of this initial garrison will make up a new motorised rifle battalion, alternatively referred to in other reports as a "modular-structured rapid response Army battalion". A later report claimed that plans were at an advanced stage for a support helicopter squadron and an Air Force "fast response Gripen jet squadron" to also be based on the island to support the new garrison and further reinforce the defences. Prior to the disbandment of the original garrison, there had been a continuous Swedish military presence on Gotland in one form or another, for nearly 200 years. After the standing down of the original garrison, a battalion of the Swedish Home Guard is based on Gotland for emergencies as part of the Eastern Military Region (MR E). The unit, 32:a Gotlandsbataljonen (the 32nd Gotland battalion), acts as a reserve component of the Swedish Amphibious Corps. Among the residual war reserve stocks reported to be still in storage on Gotland in March 2015, were 14 tanks (Stridsvagn 122s) at the Tofta skjutfält (the Tofta firing range), but without any crews or dedicated maintenance personnel assigned to them. Gotland currently has no local air defence capability. Despite its importance as a naval base in the past, as of 2004[update], there are no naval units based out of Gotland. The Tofta firing range itself (also known as the Tofta Tank firing range), is a military training ground which is located 8 km (5.0 mi) south of Visby. Another less common name for the range is the Toftasjön firing range. Tracing its origins back to 1898, as of 2008[update] the range extended over 2,700 acres (11 km2). It was a major training and storage facility for the Gotland garrison during its existence, and was still occasionally used for training by various elements of the Armed Forces since the garrison was shut down in 2005. However, from the second half of 2014 onwards, there has been a marked increase in the use of the range, especially by armored units (mostly company sized), as tensions in Northeastern Europe have escalated. At least one of the buildings on the range, the former tank repair shop, is currently owned by a private company (Peab), with the military renting back the top floor for its own use. When not used by the military, a number of cultural and sports events have been held at the range, one of the most notable being the Gotland Grand National, the world's largest enduro race. As of 2018, Gotland has received a lot more attention military-wise and has seen a much larger spending on the military. As of 2018, the Gotland Regiment has been re-raised and is the first time since World War II that a new regiment has been established in Sweden. The first modern day tourists came to Gotland during the 19th century and were known as "bathers". Gotland became very popular with socialites at the time through Princess Eugenie who lived in Västerhejde, in the west part of the island from the 1860s. When a new law ensuring two weeks vacation for all employees in Sweden was passed in 1938, camping became a popular pastime among the Swedes, and in 1955, Gotland was visited by 80,000 people. In the 1970s mostly young people were attracted to Gotland. Since 2010 the island has become a more versatile vacation spot visited by people from all over the world, in all manner of ways. In 2001 it was the fifth largest tourist destination in Sweden based on the total number of guest nights. Gotland is usually the part of Sweden which receives the most hours of sunlight during a year with Visby statistically the location with the most sunshine in Sweden. In 2007 approximately 750,000 people visited Gotland. In 1996, for the first time, ferries between Gotland and mainland Sweden carried more than 1 million passengers in a year. In 2007, the number of passengers exceeded 1.5 million. In 2012, the ferries had 1,590,271 passengers and the airlines 327,255 passengers. Based on the number of commercial guest nights at hotels, cabins, hostels, camping and private lodgings. The main port of call on Gotland is Visby. The city is visited by a number of cruise ships every year. About 40 cruise lines frequent the Baltic sea with Visby as one of their destinations. In 2005, 147 ships docked at Visby, in 2010 the number was 69. In 2014, 62 ships are scheduled to visit Visby. The decrease in visiting ships is due to the fact that the modern cruise ships are too large to enter Visby harbor. Ships must anchor a fair distance from shore whereupon passengers are shuttled to shore in small boats, which is not possible during bad weather. In 2007, the first proposition for building a new pier at Visby harbor, large enough to serve the modern cruise ships, was made. In 2011, the matter of the new pier was discussed in the Riksdag and in 2012 research and planning for the pier began. In January 2014 a letter of intent for building a new cruise pier in Visby harbor was signed by Region Gotland and Copenhagen Malmö Port (CMP). The pier is scheduled to be finished in 2018. The estimated cost is 250 million crowns (about US$38.52 million). A number of stones with grooves exist on Gotland. Archaeologists interpret these grooves as traces of an unknown industrial process in the High Middle Ages. There are approximately 3,700 grinding grooves, of which about 750 occur in the solid limestone outcrop and the rest in other rock formations. The latter often consist of hard rocks such as granite or gneiss, but also soft rocks such as sandstone occur. Grinding grooves are also found in Skåne, in southern Sweden and in Finland. Astronomer Göran Henriksson dates a number of these grinding grooves to the Stone Age, from c. 3300 BCE to c. 2000 BCE, based on astronomical alignments, although his methodology has been heavily criticized. The Medieval town of Visby has been entered as a site of the UNESCO World heritage programme. An impressive feature of Visby is the fortress wall that surrounds the old city, dating from the 13th century. The inhabitants of Gotland traditionally spoke their own language, known as Old Gutnish. Today however, that language has become a Swedish dialect known as Gutnish. In the 13th century, a work containing the laws of the island, called "the Gotlandic law" (Gutalagen), was published in Old Gutnish, as well as the Gutasaga. Gotland is noted for its 94 Medieval churches, most of which are restored and in active use. These churches exhibit two major styles of architecture: Romanesque and Gothic. The older churches were constructed in the Romanesque style from 1150–1250. The newer churches were constructed in the Gothic architectural style that prevailed from about 1250–1400. The oldest painting inside one of the churches on Gotland stretches as far back in time as the 12th century. Traditional games of skill like Kubb, Pärk, and Varpa are played on Gotland. They are part of what has become called "Gutniska Lekar", and are performed preferably on the Midsummer's Eve celebration on the island, but also throughout the summer months. The games have widespread renown; some of them are played by people as far away as in the United States. The knotwork design subsequently named the "Valknut" has the most attested historic instances on picture stones in Gotland, which include being on both the Stora Hammars I and the Tängelgårda stones. Gotland also has a rich heritage of folklore, including myths about the bysen, Di sma undar jordi, Hoburgsgubben and the Martebo lights. Gotland gives its name to the traditional farmhouse ale Gotlandsdricka, a turbid beer with much in common with Finnish sahti, and related beers from the Baltic states. There are a number of notable people born or living on Gotland, or in other major ways associated with the island. Gotland competes in the biennial Island Games, which it hosted in 1999 and 2017. Round Gotland Race-sailing event ("ÅF Offshore Race") starting at Stockholm, around the island of Gotland and back. Gotland Grand National (GGN) is an annual enduro race on Gotland. GGN is a part of the Swedish enduroklassikern (enduro classics, Ränneslättsloppet, Stångebroslaget and Gotland Grand National). GNN is the world's largest enduro race. Stånga Games are annual games for Gotlandic sports. The games are held during five days each summer in Stånga. The games are unofficially called "the Gotland Olympic Games". Some of the sports at the Stånga Games are pärk, varpa and caber toss. In 2012, there were 171 registered sports organizations on Gotland. Gotland has two senior women's sport teams playing in the first tiers: basketball team Visby Ladies Basket Club (in Basketligan dam) and floorball team Endre IF (in the Swedish Super League). Visby Ladies won the Swedish Championship in 2005. Football in the province is administered by Gotlands Fotbollförbund. The leading football club is FC Gute, playing in the fourth-tier league Division 2 as of 2014[update]. The Long Ships, or Red Orm (original title: Röde Orm), a best-selling Swedish novel written by Frans G. Bengtsson, contains a vivid description of Gotland in the Viking Age. A section of the book is devoted to a Viking ship setting out to Russia, stopping on its way at Gotland and engaging a pilot from the island who plays an important part in their voyage. Gotlanders of the Viking era are depicted as city people, more sophisticated and cosmopolitan than other Scandinavians of their time, and proud of their knowledge and skills. Naomi Mitchison, in her autobiographic book "You may well ask", relates an experience during a walking tour in Sweden: "Over in Gotland I walked again, further than I would have if I had realized that the milestones were in old Swedish miles, so that my disappointing three-mile walk along the cold sea edge under the strange ancient fortifications was really fifteen English miles". The crime novels of Mari Jungstedt, featuring Detective Superintendent Anders Knutas, are set on Gotland. In the Battlefield Vietnam video game modification Invasion Gotland, the Soviet Union invades Gotland in 1977. For the 1989 Studio Ghibli film, Kiki's Delivery Service, by Hayao Miyazaki, he and other illustrators spent time in Gotland in preparation for animation. A number of asteroids in the main-belt are named after places on Gotland or Gotlanders, such as 10795 Babben, 3250 Martebo and 7545 Smaklösa. Most of them have been named by Swedish astronomer Claes-Ingvar Lagerkvist, a summer resident on Gotland. All the Gotlandic names are vividly described in NASA's JPL Small-Body Database in connection to each asteroid. ^ a b c d "Gotland i siffror, pdf". www.gotland.se. Region Gotland. pp. 65–67. Retrieved 13 June 2014. ^ "Gotland, east coast". Ramsar Sites Information Service. Retrieved 25 April 2018. ^ "Namnet Gotland" [The name Gotland]. www.guteinfo.com. Guteinfo. Retrieved 7 April 2015. ^ a b Sailing Directions, Baltic Sea. ProStar Publications. ISBN 978-1-57785-759-4. ^ a b Knowles, Heather (2010). Passport Series: Western Europe. Lorenz Educational Press. ISBN 978-1-4291-2255-9. ^ a b Encyclopædia Britannica. "Zealand". Britannica.com. Retrieved 31 May 2014. ^ a b c "Fakta om Gotland". Website. Länsstyrelsen Gotland. Retrieved 31 May 2014. ^ Outram, A. K. 2006. Distinguishing bone fat exploitation from other taphonomic processes: what caused the high level of bone fragmentation at the Middle Neolithic site of Ajvide, Gotland?, pp. 32-43. In Mulville, J and Outram, A (eds). The Zooarchaeology of Milk and Fats. Oxford: Oxbow Books. ^ DNA study published in nature.com on April 26, 2012. Pontus Skoglund on prehistoric Gotlanders: "The hunter-gatherers show the greatest similarity to modern-day Finns." ^ "Gutagatan, based on Gannholm's 1992 edition". www.runeberg.org. Project Runeberg. Retrieved 13 June 2014. ^ Enderborg, Bernt. "Staten Gotland". www.guteinfo.com. Guteinfo. Retrieved 13 June 2014. ^ "Discovery of Muscovy by Richard Hakluyt – Project Gutenberg". Gutenberg.org. 1 May 2003. Retrieved 11 August 2010. ^ Johansson, Marcus; Jonsson, Kenneth (1997). "Islamiska mynt" (PDF). www.archeology.su.se. Numismatiska forskningsgruppen, Stockholms universitet. p. 2. Retrieved 13 June 2014. ^ "Vikingarnas historia". www.rosala-viking-centre.com. Rosala Viking center. Archived from the original on 14 December 2013. Retrieved 13 June 2014. ^ Jansson, Sven B. F. (1962). The runes of Sweden. Stockholm: Norstedt. pp. 3–4. Retrieved 11 June 2014. ^ Åhlin, Christer. "Verktygskista från Mästermyr". www.historiska.se. Historiska Museet. Archived from the original on 6 June 2014. Retrieved 5 June 2014. ^ Hellner, Brynolf. "Tidigare publikationer om Mästermyrfyndet". wwwhistoricallocks.com. Historical locks. Archived from the original on 6 June 2014. Retrieved 5 June 2014. ^ "Spillingsskatten". www.historiska.se. Historiska Museet. Retrieved 17 June 2014. ^ "Unikt mynt hittat i Spillingsskatten". www.hallekis.com. Hallekiskuriren. Retrieved 17 June 2014. ^ Ann-Marie Pettersson, ed. (2008). Spillingsskatten: Gotland i vikingatidens världshandel. Visby: Länsmuseet på Gotland. ISBN 978-91-88036-69-8. Retrieved 17 June 2014. ^ Ström, Jonas. "Världens största vikingatida silverskatt". www.historiska.se. Historiska museet. Retrieved 17 June 2014. ^ Yrwing, Hugo (1986). Visby – hansestad på Gotland (in Swedish). Stockholm: Gidlund. ISBN 91-7844-055-6. Retrieved 12 June 2014. ^ a b c d e Martinsson, Örjan. "Gotland". www.tacitus.nu. TACITUS.NU. Retrieved 12 June 2014. ^ Sundberg, Ulf (1997). Svenska freder och stillestånd 1249–1814 (in Swedish) (1 ed.). Hargshamn: Arte. ISBN 91-89080-01-7. Retrieved 12 June 2014. ^ Westholm, Gun (2007). Visby 1361: Invasionen (in Swedish). Stockholm: Prisma. ISBN 978-91-518-4568-5. Retrieved 12 June 2014. ^ Lingström, Allan. "Invasionen-fakta och teorier". www.masterby1361.se. Mästerby1361. Retrieved 13 March 2018. ^ Englund, Peter (2003). Ofredsår (in Swedish). Stockholm: Atlantis. pp. 368 and 394. ISBN 91-7486-349-5. ^ "Välkommen till Region Gotlands hemsida!". www.gotland.se. 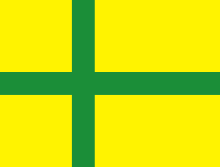 Region Gotland. Retrieved 13 June 2014. ^ "Länsstyrelsen Gotlands län". www.lansstyrelsen.se. Länsstyrelsen Gotlands län. Retrieved 13 June 2014. ^ "Visby Stift". www.svenskakyrkan.se. Sveska Kyrkan. Retrieved 13 June 2014. ^ "Förordning om district" [Regulation of districts] (PDF). Ministry of Finance. 17 June 2015. Retrieved 23 March 2018. ^ "Gotland i siffror 2013 ("Gotland in numbers 2013")". pdf. Region Gotland. Retrieved 1 June 2014. ^ "MP Atlas; Hoburgs Bank Special Protection Areas (Birds Directive)". Archived from the original on 23 September 2016. Retrieved 1 September 2016. ^ "Monthly & Yearly Statistics". SMHI. Retrieved 3 March 2016. ^ "Precipitation normals 1961–1990". SMHI. Retrieved 3 March 2016. ^ a b Laufeld, S. (1974). Silurian Chitinozoa from Gotland. Fossils and Strata. Universitetsforlaget. ^ Long, D.G.F. (1993). "The Burgsvik beds, an Upper Silurian storm generated sand ridge complex in southern Gotland". Geologiska Föreningens i Stockholms Förhandlingar (GFF). 115 (4): 299–309. doi:10.1080/11035899309453917. ISSN 0016-786X. ^ Laufeld, Sven; Martinsson, Anders (22–28 August 1981). "Reefs and ultrashallow environments. Guidebook to the field excursions in the Silurian of Gotland". Project Ecostratigraphy Plenary Meeting. ^ Gibson, Mimmi. "Gotländskt näringsliv". Website. Länsstyrelsen Gotland. Archived from the original on 26 October 2014. Retrieved 31 May 2014. ^ "Gotland i siffror 2013 ("Gotland in numbers 2013")". pdf. Region Gotland. p. 18. Retrieved 31 May 2014. ^ "Därför säljs Gute vingård". www.helagotland.se. Gotlands Tidningar. 3 November 2015. Retrieved 9 February 2017. ^ Pappinen, Lauri. "English information". www.gutevingard.se. Gute Vingård AB. Retrieved 9 February 2017. ^ Milne, Richard. "Sweden sends troops to Baltic island amid Russia tensions". ft.com. Retrieved 12 March 2015. ^ O'Dwyer, Gerard (20 March 2015). "Sweden Invests In Naval Capacity, Baltic Sea Ops". DefenseNews. Archived from the original on 4 April 2015. Retrieved 22 March 2015. ^ Olsson, K. "Militärbefälet på Gotland" [Military command on Gotland]. www.tjelvar.se. Gotlands Militärhistoria och Gotlands Trupper. Retrieved 14 March 2015. ^ "Gotlandsbataljonen". www.forsvarsmakten.se. Swedish Armed Forces. Archived from the original on 15 July 2015. Retrieved 14 March 2015. ^ Braw, Elisabeth. "Gotland Island, the Baltic Sea's Weak Link". www.worldaffairsjournal.org. World Affairs. Retrieved 14 March 2015. ^ "Stridsvagnar åter på Gotland" [Tanks return to Gotland]. www.forsvarsmakten.se. Swedish Armed Forces. Retrieved 14 March 2015. ^ a b "I 19 tar över på Gotland" [In 19 takes over on Gotland]. Swedish Armed Forces. Retrieved 14 March 2015. ^ a b Kadhammar, Peter. "Blir det krig får armén köpa mat på Ica Maxi" [If the war comes, the army will have to buy their food at Ica Maxi]. www.aftonbladet.se. Aftonbladet. Retrieved 14 March 2015. ^ a b Olsson, K. "Militärbefälet på Gotland". www.tjelvar.se. Gotlands Militärhistoria och Gotlands Trupper. Retrieved 14 March 2015. ^ Olsson, K. "Gotlands Marindistrikt – Visbyavdelningen (Vba) – 1931–1956" [Gotland Navy District – Visby section – 1931–1956]. www.tjelvar.se. Gotlands Militärhistoria och Gotlands Trupper. Retrieved 14 March 2015. ^ Gottfridsson, Thomas. "GGN firar 30 år med rekordantal" [Record breaking number of participants celebrates 30 years of GNN]. www.helagotland.se. HelaGotland. Retrieved 14 March 2015. ^ Jonsson, Marita (1987). Vägen till kulturen på Gotland. Gotländskt arkiv, 0434-2429 ; 59(1987). Visby: Gotlands fornsal. ISBN 91-971048-0-9. ^ "Ljugarn, historia". Website. Ljuvliga Ljugarn. Retrieved 31 May 2014. ^ a b c "Turisthistoria". Website. Länsstyrelsen Gotland. Archived from the original on 26 October 2014. Retrieved 31 May 2014. ^ "Gotland populärt turistmål". Website. Sveriges Radio. Retrieved 31 May 2014. ^ Sjögren, Helena. "Solkrig pågår mellan Karlskrona och Visby". Website/Newspaper. Expressen & SMHI. Retrieved 31 May 2014. ^ Fritz, Staffan. "Passagerare nr 1500000". Website/Newspaper. Helagotland. Retrieved 31 May 2014. ^ "Gotland i siffror 2013 ("Gotland in numbers 2013")". pdf. Region Gotland. p. 27. Retrieved 31 May 2014. ^ "Gotland i siffror 2013 ("Gotland in numbers 2013")". pdf. Region Gotland. p. 24. Retrieved 31 May 2014. ^ a b c d e These numbers do not include visitors arriving by cruise ship. See section "Cruise ships". ^ Klint, Kerstin. "Större kryssningsfartyg till Visby". www.gotland.net. Visit Gotland. Retrieved 2 June 2014. ^ Visitors on these ships are not included in the statistics in the section above since they come to Gotland in ships owned by other shipping companies than Destination Gotland, and these visitors only disembark during the day and do not use the accommodation available on Gotland. ^ Stenberg, Johan (31 March 2010). "Bara 69 kryssningsfartyg till Visby". Website/Radio programme. P4 Gotland. Sveriges Radio. Retrieved 2 June 2014. ^ a b c "Att angöra en kaj eller passera en ö, pdf". www.gotland.se. Sweco Eurofutures AB. Retrieved 2 June 2014. ^ Wahlberg, Lars. "Cruise Calls 2014, Port of Visby, pdf". www.gotland.se. Port of Visby, Teknikförvaltningen, Hamnavdelningen, Region Gotland. Archived from the original on 6 June 2014. Retrieved 2 June 2014. ^ Staflin, Mona; Pettersson, Mats (18 November 2013). "Kryssningskaj kan ge 130 miljoner". Newspaper/website. Gotlands Allehanda. Helagotland. Retrieved 2 June 2014. ^ Wesley, Stefan. "Planer för en kryssningskaj i Visby". www.gotland.se. Region Gotland. Retrieved 2 June 2014. ^ Engelhart, Christer. "Motion 2011/12:T416 Kryssningskaj i Visby". www.riksdagen.se. Sveriges Riksdag. Retrieved 2 June 2014. ^ Andersson, Lars (29 January 2014). "Ny kryssningskaj i Visby". Website/Newspaper. Sjöfartstidningen. Retrieved 2 June 2014. ^ Bringmark, Karsten (25 March 2014). "CMP förhandlar om kryssningskaj i Visby". Website/Newspaper. Skånskan. Retrieved 2 June 2014. ^ Gibson, Olov (2013). "Gotlands slipskåror: spår av friktionsbromsar hos väderkvarnar?". Fornvännen. 108 (2): 130–133. Retrieved 13 June 2014. ^ Henriksson, Göran (1983). "Astronomisk tolkning av slipskåror på Gotland" (PDF). Fornvännen. Royal Swedish Academy of Letters, History and Antiquities. ^ Lindström, Jonathan; Roslund, Curt (2000). "Göran Henrikssons nonsensforskning". Folkvett. Vetenskap och Folkbildning. ^ "Hanseatic Town of Visby". www.whc.unesco.org. UNESCO World Heritage List. Retrieved 13 June 2014. ^ Olsson, K. "Gutalagen på svenska". www.tjelvar.se. Gotlands Militärhistoria och Gotlands Trupper. Retrieved 13 June 2014. ^ Andrén, Anders (2015). Det medeltida Gotland: En arkeologisk guidebook. Det medeltida. 8. Svenska Historiska Media Förlag AB. ISBN 9187031310. ^ Lagerlöf, Erland; Svahnström, Gunnar (1973). Gotlands kyrkor: en vägledning (in Swedish) (2. omarb o utök. uppl. ed.). Stockholm: Rabén & Sjögren. ISBN 91-29-41035-5. Retrieved 13 June 2014. ^ a b "Stångsspelen". www.stangaspelen.com. Föreningen Gutnisk Idrott (FGI). Archived from the original on 4 January 2014. Retrieved 8 June 2014. ^ "Valknut, triskele, Hrungnir's hjärta". www.guteinfo.com. Guteinfo. Retrieved 13 June 2014. ^ "Saga". www.guteinfo.com. Guteinfo. Retrieved 13 June 2014. ^ Wallin, Inga-Lill. "Marteboljuset". www.ufo.se. UFO Sverige. Archived from the original on 6 January 2010. Retrieved 13 June 2014. ^ "Dricku". www.guteinfo.com. Guteinfo. Retrieved 12 June 2014. ^ Pettersson, Mats (9 December 2011). "Berömda gotlänningar" [Notable Gotlanders]. www.gotland.net. Gotlands Media AB. Retrieved 13 January 2019. ^ "Gotland – Member profile". www.islandgames.net. INternational Island Games Association. Retrieved 8 June 2014. ^ "The Official 2017 Island Games website". Archived from the original on 10 February 2015. Retrieved 10 February 2015. ^ "ÅF Offshore Race". www.ksss.se. Royal Swedish Yacht Club. Retrieved 8 June 2014. ^ "Gotland Grand national". www.nordicsportevent.se. Nordic sport & event. Retrieved 8 June 2014. ^ "Världens största endurotävling går av stapeln". www.tv4.se. Tv 4, Sweden. Archived from the original on 14 July 2014. Retrieved 8 June 2014. ^ "Gotland i siffror 2013 ("Gotland in numbers 2013")". pdf. Region Gotland. p. 41. Retrieved 1 June 2014. ^ "Teams in Basketligan dam". Swedish Basketball Federation. Retrieved 12 June 2014. ^ "Women's Swedish Super League". Swedish Floorball Federation. Retrieved 12 June 2014. ^ "Visby Ladies svenska mästare i basket 2005" (in Swedish). guteinfo.com. Retrieved 12 June 2014. ^ "Gotlands idrottsförbund". www.gotsport.se. Gotlands idrottsförbund. Retrieved 8 June 2014. ^ Naomi Mitchison, You may well ask", London, 1979, Part I, Chap 7. ^ Joelsson, Johan (2014). "Vem döper stjärnorna?" [Who is naming the stars?]. www.spraktidningen.se. Språktidningen. Retrieved 25 June 2016. There are over 8,700 titles about Gotland in the National Library of Sweden on line database LIBRIS. About 560 of the books are in English. See: LIBRIS. Look up gotland in Wiktionary, the free dictionary. Wikimedia Commons has media related to Gotland. Wikivoyage has a travel guide for Gotland. "Gotland" . Encyclopædia Britannica. 12 (11th ed.). 1911. "Gotland" . New International Encyclopedia. 1905.